I so loved this novel, Good on Paper, and so did NPR, calling it "a wonderfully exuberant mixing of registers: scholarly to colloquial to campishly zany and back." 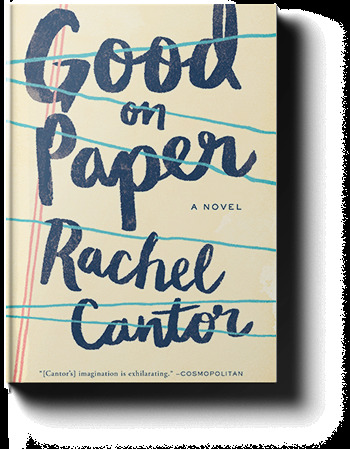 Rachel Cantor is the author of A Highly Unlikely Scenario and her newest, Good on Paper, is racking up the raves everywhere. 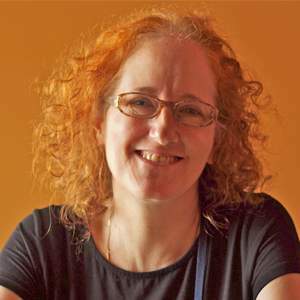 She's been nominated for three Pushcart Prizes, short-listed for the O. Henry Awards and Best American Short Stories, and she's absolutely fascinating. She also freelances as a writer for nonprofits that work in developing countries like Zimbabwe, Nigeria, and Laos. She's worked at food festivals and taught Afghan women refugees in Pakistan. Plus, she loves the Boston Red Sox. I'm so delighted to have her here. Thank you, thank you, Rachel! So much of your wonderful novel is about second chances—and how we read or misinterpret them. Can you talk about this, please? Thank you for calling my novel wonderful and thanks for the thoughtful question! Yes, the book is to a large extent about second chances. My protagonist, Shira Greene, is stuck. She had big dreams when she was a girl, as a young woman she was a rising academic star, but now she’s a bored file clerk who bristles when her bosses tell her to smile. This isn’t what she’d intended for her life but she can’t imagine anything better. Like many characters in fiction, she needs a deus ex machina to bust in and change everything. And he does, in the form of an eccentric Italian poet—and thank heavens, or Shira would still be temping in New Jersey, unsure why she’s so unhappy. In the end, though, it’s not enough that someone pushes Shira to change—it’s the necessary but not sufficient condition for change, as the philosophers say. She’ll also need to make some choices herself, she’ll need to act. It’s not enough that she be given a second chance: she also needs to take chances. This is her “test,” in the language of the book. Her true second chance is the one she takes after she runs out of the chances she’s been given, if that makes sense. What kind of writer are you? Do you know where you are headed when you embark on a novel or are you surprised on every page? I knew where Good on Paper had to end, but I didn’t at all know how I’d get there; this is typical of how I work. I never outline, though I did in this case have a sense of the book’s seven-part structure from a rather early stage, which helped me understand (in general terms) as I wrote and revised how the plot would unfold (what is Shira’s call to action, what is her test, etc.). Beyond that, I couldn’t predict much! To give a simple example: I introduced a cat in an early chapter, with no idea that she would become important. I just thought, we’re in a bookstore, bookstores should have cats! But once she was there, and had a name (Marla), and began sitting regally in her Simon and Schuster box with her kittens, which she loses, once it became clear that she was dear to the bookstore proprietor, she became “material” I later needed to use (like a gun which once introduced has to eventually go off). She became part of an organic process over which I had some but not complete control; this means that what happens next you can’t always predict. So there were for me surprises galore, and not just on the page level. I remember writing a quite emotional scene where Shira has to talk to her daughter Andi, who’s in some distress. I knew I needed to intensify the scene, but I didn’t know how: Shira needed to say something important to her daughter, but what? I didn’t even know what her daughter needed to hear! I started walking blindly down a sentence, with no idea where it would lead. I felt very much like I was on a branch that might not carry me (am I mixing metaphors? sorry!). This was actually a bit terrifying. What happened at the end of that sentence truly surprised me—it made me cry, in fact—though now it seems inevitable. That’s the ideal, to me, to be that open every moment as I write. Sometimes I feel I can sense when a book I’m reading has been “outlined,” when a scene is written so it can be ticked off a list of “necessary scenes”; more often than not, I put that book down. Did you do research on translation? What surprised you about the process—and did you try some yourself? I did a lot of research on translation! I read books of essays on both translation theory and practice, as well as a number of articles, especially when they had to do with translation from the Italian. I had tried some poetry translation here and there earlier in my life, mostly as a quite young person, for my eyes only, and had no illusions about how difficult it is. I also translated various lines from the Italian, German, and Hebrew for Good on Paper, though often my translations owed much to the prior efforts of my betters (for example, in a scene in which two characters collaborate on a translation of a famous verse from the Song of Songs, which process I describe here). At a recent residency, however, I was recently asked to help an American poet who doesn’t speak Italian and a Bulgarian translator who translates from the Italian but doesn’t speak English quite as well translate a poem written by a Swiss poet from Italian into English (if that all makes sense). None of us had sufficient skills to do the job alone; collectively, the hope was that we could. I, however, only embarrassed myself by my poor contributions, consistently misunderstanding individual words and overall sense. Hilarity ensued (chronicled here) So yes, even while I understood intellectually how difficult translation is, I had to have this recent experience to understand it in my bones! More than one critic has commented on how much you seem to love your characters, however deeply flawed. Don’t you think this has a lot to do with the whole idea of translating—finding the real meaning of a text—and of a person? That’s high praise to me because it suggests that I’ve done my job—creating complex characters we can love (if I love and respect them, the reader can, too). I hadn’t thought of that process as being similar to translation, but of course it has to be: in both cases, we listen, right? We listen attentively and with an open mind. When we really listen—to what a character says, to what a text says, also reading between the lines of what they say, thinking about what they don’t say, what they’re trying to hide and why, aware then of their flaws and fragility, which are our flaws and fragility—we experience compassion, and then understanding and love—for a character, for a text. At least I think so! My work-in-progress should be the answer but it’s not. I’m revising that book—a novel-in-stories that takes an imaginative look at the lives of the Brontë siblings. But it’s at an awkward adolescent phase—all limbs, confusion, and difficult emotion—close to maturity but not there yet. So naturally, I’ve had a great idea for a next book! Every day I have more exciting thoughts about how that book might progress, and how fun it’ll be to write! Not the first time this has happened—my difficult work-in-progress was once the shiny idea I enjoyed thinking about when Good on Paper gave me trouble!